Through the noise of the clattering spring rains against the conservatory, the doorbell rings. By the time you reach the front door, your visitor is found shaking off the shower, looking grateful for the spatial oasis of shelter formed by a smart metal porch canopy. Come on in you say, the kettle’s on. Or maybe the sight you’re met with is of the more bedraggled, anxious to get past you kind because, in reality, you have a more bare doorway, exposed to the elements and pleading for protection? Whether your place is a home or business premises, of traditional heritage or modern building design, Garden Requisites has your entrance welcome stylishly, safely and solidly covered. British streets are built in all manner of architectural styles from many historical periods and it’s important that any new additions to these styles positively enhance and are sympathetic to the overall look of the street and surroundings as well as the building itself. Georgian townhouses, Victorian cottages, Edwardian terraces, even more modern concrete structures can all benefit from our meticulously made-to-measure galvanised steel structures. When considering a metal door canopy or porch, choosing handmade, well-crafted, long lasting and very considered designs will make all the difference. To see our canopies and porches suiting varying building styles, do scoot across to our Pinterest boards. Keep in mind too the appearance of sheltered entrances around a building, not only for front entrances but rear and side doors also. A long stretch of scooped door canopy over some patio or French doors gives a lovely sense of old veranda style design and can give precious shelter for the switching of footwear when dashing in and out. Extending further into the garden, a garden designer worth their salt will always want to weave in elements that have good ‘continuity’ and that nod to the garden’s adjacent surroundings – a thread of common design themes that result in satisfying ‘cohesion’ in the overall look. As well as supplying metal trellis to fix to adjacent entrance walls, steel planters to frame the feet of doorways and window boxes to add splashes of colour and greenery, other complementing Garden Requisites’ garden structures – garden arches, fences and even gazebos – can be provided in a matching finish to doorway canopies and porches – super swish! 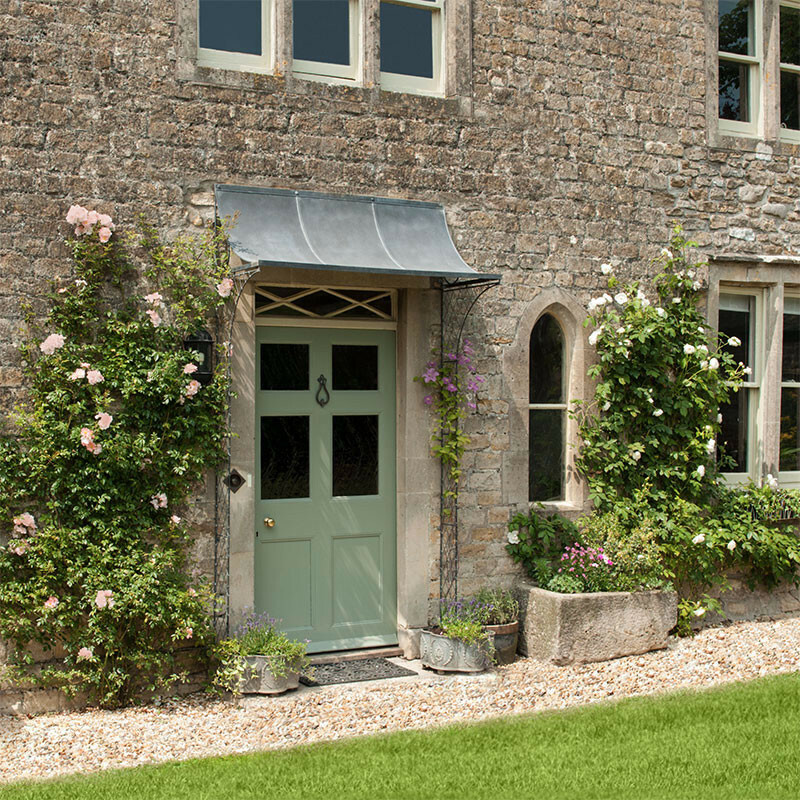 Garden Requisites’ zinc-galvanised steel door canopies come scooped or arched and in a variety of standard sizes and we’re also very happy to talk through bespoke measurements, advising how to work round awkward existing architectural features. Our porches are door canopies with columns or lattice sides that reach down to the ground, lovely for climbing plants to twine up and even more sheltered with sides included. Various porch designs include Georgian and Ironwork Porches, which add a pleasing air of authenticity for older properties. As for installation, matching fixings are provided with each canopy or porch and plenty of advice is on hand from Hilary and team, who are very well versed in fixing the designs safely to all manner of building fabric. More measuring, finishes, installation and delivery detail can also be found via the ‘More…’ links for each design. Do have a browse. Maybe in a few weeks a smart new porch will be fending off any inclement summer showers when guests come a-calling?